A comprehensive study of marine life sponsored by Conservation International (CI) and implemented jointly with the IUCN (World Conservation Union) used data from the Galapagos-based Charles Darwin Research Station and other regional institutions to conclude that three species of corals unique to the Galapagos Islands could soon disappear forever. The Galapagos marine research was conducted by the Global Marine Species Assessment (GMSA), a joint initiative of IUCN and CI launched in 2005 with the support of dozens of experts and research institutions. The GMSA is studying a large portion of Earths marine species to determine the threat of extinction. What is significant is that climate change and over-fishing two of the biggest threats to marine life are the likely causes in these cases. Researchers blame climate change for more frequent and increasingly severe El Nio events that have caused dramatic rises in water temperatures and reduced nutrient availability around the Galapagos Islands in the Eastern Tropical Pacific Ocean, off South America. The warmer water harms corals and algae, both of which constitute the structural foundation of unique and diverse marine ecosystems. Corals build reefs that are habitat for fish and other marine life, and also are a major attraction for divers in the Galapagos, where tourism makes a significant contribution to the local and national economy. The recovery of algae species following strong El Nio events is harmed by over-fishing of the natural predators of sea urchins, which feed on the algae. Mushrooming urchin populations scour rocks clean of algae, depleting a major food source for other species such as the Galapagos marine iguana. Marine ecosystems are vulnerable to threats at all scales globally through climate change, regionally from El Nio events, and locally when over-fishing removes key ecosystem building blocks, said Jane Smart, head of the IUCN Species Program. We need more effective solutions to manage marine resources in a more sustainable way in light of these increasing threats. Tale of a peahen in our midst ! The 29th day of August 2007, 6.30 PM witnessed an unusual event at IIC Annex - “Peafowl Nesting”, second in a series of events organized by the newly formed Nature Group of IIC. It was that time of the year when peahens lay their eggs and incubate them for about 29 days before the eggs hatch. The chicks are timed to come out just as the monsoon arrives in North India. The peahens in Delhi’s Lodi Park, finding the Lodi lawns lacking in the privacy and security needed for egg hatching, started looking around for safer ground. The nearest large green space happened to be the IIC Lawns! But here again the lawns are manicured and tended to by the ‘Malis’ all the time. So, where next? A smart one flew right onto one of the ledges provided on each floor of IIC for keeping a pot of green ferns. Laid the eggs one by one and started incubating them. The ledge happened to be next to the dining hall of IIC. But the peahen was lucky. The waiters at the dining hall ensured that the curtains were drawn all the time so that curious diners did not distract the peahen. The nature group at IIC was informed. A slide presentation on the Blue peafowl and a screening of “Sarang the Peacock” was organized on 27 May 2007. Rajesh Bedi (of Bedi Bros ) installed a close circuit TV in the dining hall so that the activities of the peahen, aptly called Matari, can be monitored. By August, the chicks hatched and were busy eating and playing under the watchful eye of the peahen who gathered them under her wings at the slightest sign of disturbance. It was time to meet and take stock and also to spread the story. On the 29th of August 2007 Mr. Samar Singh (World Pheasants Association-India) welcomed the gathering emphasizing the event of the year-a peahen nesting 30 feet above ground, a phenomenon not yet recorded in ornithology books. Is it an act of desperation or a graceful adaptation to reality where green cover and safety are both scarce to come by for the peahen? Once widely seen in India, the peafowl is now limited to certain pockets in India. Prof. M.G.K Menon, President IIC in his keynote address quoted Gandhi’s prophetic words “ Nature gives enough for man’s needs but not enough for man’s greed". The nesting of the peafowl might have been an insignificant event but for the nature group’s efforts to bring it to focus and put it in perspective. Prof. Menon was happy to see the group of nature lovers present in the hall, who braved the pulls of competing events around the neighborhood, to understand the problems faced by our National Bird. The hatching of the chicks in a precarious perch and the subsequent care by the IIC staff on a call beyond duty shows the interdependence of man and nature. Taking inspiration from nature warriors of old like the "Chipko Women", the time has come for each one of us to become a nature warrior in the situation he or she is placed in. After the larger picture given by Prof. Menon, it was time to watch the story of Matari being documented as it is unfolding in the IIC lawns. The story so far was superbly scripted and edited by the Bedi brothers in a short yet powerful film-‘Matari-Story of a Peahen’. The delicate interaction of man and bird –the former wanting to protect and the latter accepting with grace help offered- was touching and thought provoking. The future of our wildlife especially urban wildlife is dependent on man’s dispensations more and more. Play of passion-Tusker style ! A wild tusker from Jharkhand enacted a play of passion in the middle of the night, broke through the fence of a circus and eloped with a female circus elephant. Drawn by calls of the four female elephants in the circus, the 26-year-old tusker raided the circus, broke the tin barricade and barged into the stable where the female elephants were kept, reports said. It didn’t take long for Savitri, four years older than him, to give in to his wild charms. Despite entreaties from her keeper, the female elephant broke free of her shackles and went with him into the jungle where the residents spotted the two frolicking near a pond. The tale of love and passion has shocked Savitri’s manager Chandranath Banerjee, who has sought the forest department’s help to trace the female elephant. "I have never seen anything like this. Savitri’s loss could be huge as she was one of our prized elephants," he said. The elephants were finally spotted moving from Badam Bagan to Nepali Para in Raniganj by a district forest officer in Durgapur, Kumar Bimal. When a team of forest department officials along with her keeper Kalimuddin Sheikh tried cajoling Savitri to come back, she entwined her trunk around her lover’s leg in a show of defiance. A crestfallen Kalimuddin said this was the first time she had disobeyed him. Till late at night, the forest officials were seen trailing the pachyderms with flaming torches. They were last seen heading towards Mejia in Bankura district along the Ranigunj-Mejia Road. 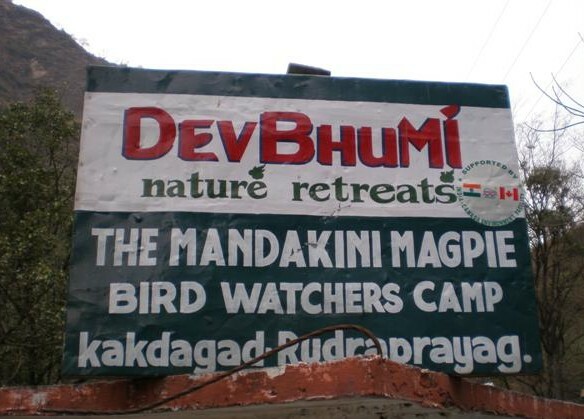 The Mandakini Magpie Bird Watcher’s Camp! Even as some of us sit in Delhi and discuss the intricacies of ecotourism and how it’s different from tourism, there are people all over this country who are practicing the former – in the real sense of the word (‘eco’-tourism). 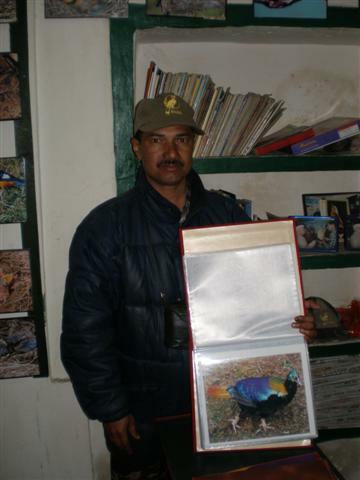 One such person is Mr. Yashpal Singh Negi who runs a bird watching camp christened, ‘The Mandakini Magpie Bird Watchers Camp’. One such person is Mr. Yashpal Singh Negi who runs a bird watching camp christened, ‘The Mandakini Magpie Bird Watchers Camp’. 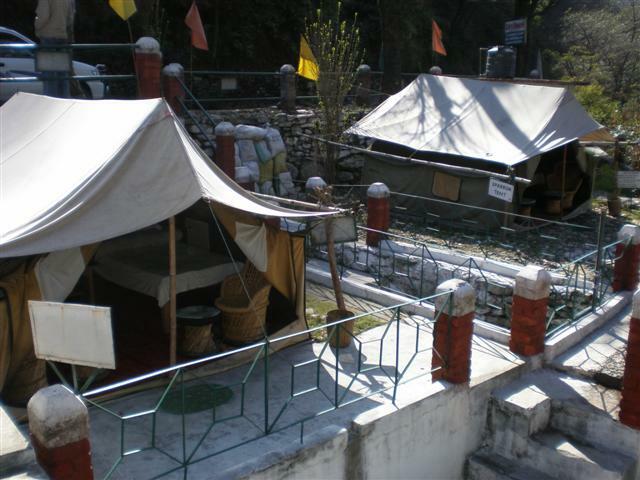 The camp is located in Kakragad on the bank of River Mandakini en route to Sri Kedarnath, a few hours drive from Rudraprayag. Mr. Negi is a wonderful person who is not only dedicated towards his work but also has in-depth knowledge about birds and the Himalayas. He has been running this camp for the past seven years which is wonderfully exemplified by his experience and expertise. Apart from bird watching, Mr. Negi also takes interest in collecting good books on orinthology. 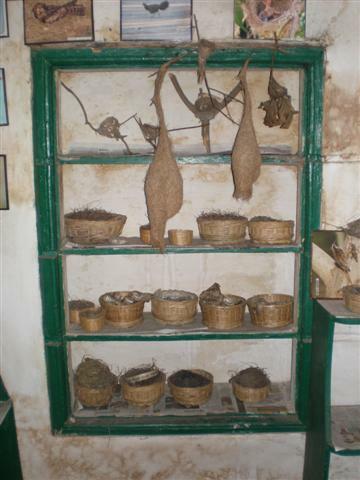 He even has a good collection of abandoned bird nests and also of some classic books on bird identification, wildlife and Himalayan Biodiversity. Lately, he has also started making a herbarium of those plant species in which the birds make their nest or feed. Mr. Yashpal Singh Negi may not know the difference between Tourism and Ecotourism. He may not have even heard of ecotourism. But how he runs his bird watchers camp can be a basic case study of ‘ecotourism in the Himalayas’. He runs his camp all himself with some help from other people of the area. The tent houses are well maintained and are very inviting with names like ‘Woodpecker Tent, Sparrow Tent, etc! In his camp, very little of ‘transmitted’ electricity is used. 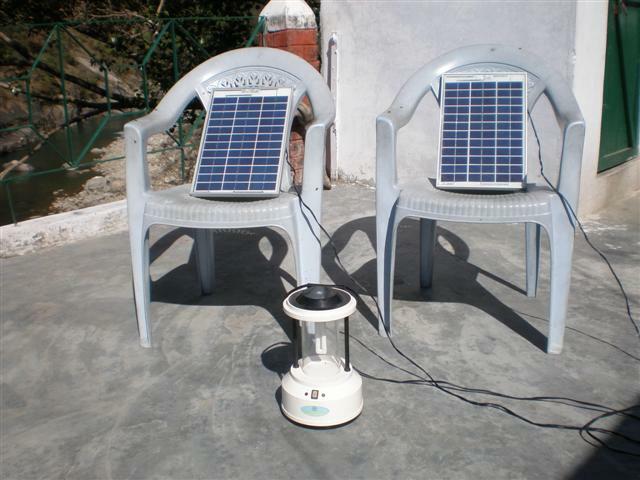 He has solar lanterns which are extensively used instead of the regular electricity. All in all, a visit to the Mandakini Magpie Bird Watchers Camp is a must for every bird watcher, nature lover or for anyone who wants a lesson or two in Ecotourism! Kedarnath Musk Deer Sanctuary - A pictorial travelogue! Travelogue: A Visit to the Kedarnath Musk Deer Sanctuary! While words may fail...pictures never! 1. Sonprayag Township: The Base Camp. While it is difficult to find a place to step a foot during the warm season (of the Sri Kedarnath yatra), the town is lazy and ghostly during the rest of the year. 3. Entry bridge to the Kedarnath Musk Deer Sanctuary - just above Sonprayag. 4. Gaurikund: The last motorable town en route to Sri Kedarnath. Steps lead to the entry-gate of the 14 Km. trek to Sri Kedarnath. 8. and 9. An interesting fungus and the HIMALAYAN TAHR!! 13. Nature is kind enough to the wildlife - to prevent people from going above Jangal Chatti (owing to avalanches, snow, etc.) Am glad it is! So, the best view of Sri Kedarnath that I got. 14. Back to Sonprayag - to make the long journey back home. 15 . A View of the Chaukhamba peak several kilometers away from where it is (zoomed into focus)! Just a reminder of the glorious glory of the Himalayas. Reminded me of a poem I had read long back in my Hindi class.."Giriraj Himalaya ka Bharat se kuch aisa hi naata hai...."
P.S. The above was a University of Delhi Research trip. Unless one has a permission (at times not even then), it is not possible to go beyond Gaurikund during off-season. The images can be used for any socially useful purpose after proper citation. Out of adventure for a long time, I decided to cycle from Mysore to Waynad, through Bandipur. Took my cycle from BLR to MYS by bus and began cycling. The road was plain and flat did not cause much trouble(except for head wind). I knew Bandipur linked Banerghata and cauvery range. The locals assured me that the elephants were less dangerous when compared to their presence in Banerghata(many factors for this). Well as I entered Bandipur (No gaurds at their post, luckily) a huge hoarding welcomed me, it read "WELCOME TO BANDIPUR, PART OF PROJECT TIGER". A huge lump in my throat, but pressed on faster never taking a break even to leak. As I cycled, I became part of nature & enjoyed it thoroughly. Also realised the animals are as scared of humans like we are about them. It took me just a day to cycle about 125 km (Fear, Exitement all combined). Singapore is getting hotter and wetter. According to the National Environment Agency, average temperatures in the city-state have risen by between 1º and 1.5º Celsius over the past 50 years. The agency, which suggests that global warming may be the culprit, also reported an increase in rainfall, noting that December 2006 was the wettest on record. The agency is expected to publish a larger study on Singapore’s future weather conditions sometime next year.